By now it seems like twice-monthly night The South London Soul Train is Peckham and London’s worst kept secret. A crowded floor pulsating to a melee of soul jams keeps the temperature firmly at hot-box level, and the crowded nature seems to be the norm for the night which has built up it’s reputation over the years. 5th September brought The Fatback Band to Peckham, the latest in a long line of top notch acts hosted at The South London Soul Train. The funk and disco outfit, classed within the ‘originators of the genre’ bracket from back in the 70’s, showed their experience in taking a stage and floor to a level that only live instrumentation can. Taking proceedings for the rest of the night on the first floor was night director Jazzheadchronic, while working the second floor right up until the 5am finish was Snowboy & Perry Louis. 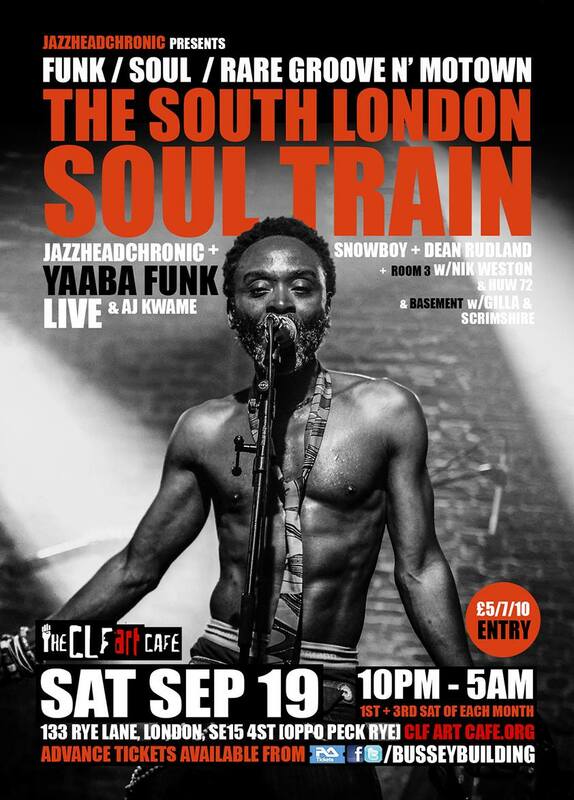 Next up, Yaaba Funk brings his live set south of the river on 19th September. The man has previously supported the likes of Ebo Taylor and Sean Kuti, so trust their judgement. Get your tickets here.